Click on the ad above to visit the VisionsfcuRocks website. 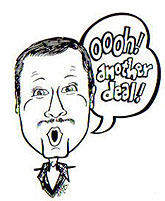 Click on the ad above or here to go to a New Image page. The Odessa-Montour Class of 2017 poses in the O-M gym before Commencement. ODESSA, June 23, 2017 -- A total of 42 seniors were presented diplomas Friday night at the 2017 Odessa-Montour High School commencement ceremony, held before a capacity crowd in the school's Fetter-Brown Auditorium. The class Salutatorian was Madison Morse. 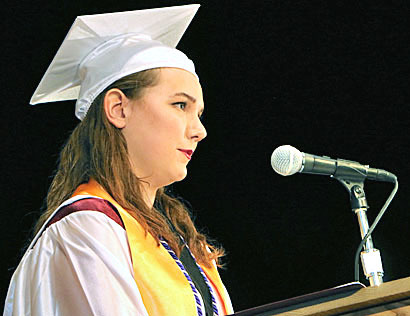 The Valedictorian was Emelia Paulisczak, who in a speech urged the graduates not to be afraid to make mistakes, "for if you do, it means you're trying new things." And she told them that "the greatest things in life are the ones you have to work the hardest to achieve." High School Principal Almon "Skip" McCarty was the emcee, telling the graduates: "As Superintendent Chris Wood told you at graduation practice, O-M will always be here for you." The Graduation Address was presented by Charlie Wood, brother of the superintendent, a 1993 graduate of O-M and a 1997 graduate of SUNY Oswego with a degree in Business Administration. He is currently a partner in a cyber security consulting firm based out of Rochester that helps large companies defend themselves from hackers and cyber terrorists. He noted that technology "has drastically changed from when I was in high school" -- but that the massive changes in internet access and the fact that "you can get anything you want off your phone" come with problems. Newspapers have dwindled, he noted, and with them has come unemployment and a drop in lumber and paper production. Working at home impacts the auto industry (no driving to work), the clothing industry (no new dress clothes for the office) and maintenance employment (with offices closed). He told the graduates that they are an important generation that must figure out "where we will get jobs" as those that previously existed "go away." After monetary awards and scholarships were presented, diplomas were presented to the 42 O-M graduates. 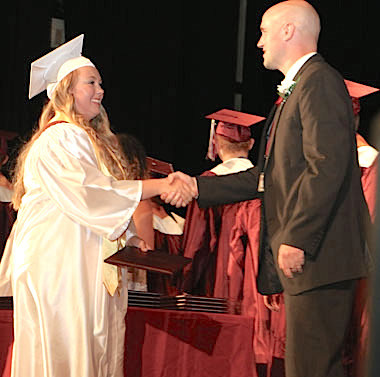 Photos in text: From the top: Dasia Herrmann receives her diplomas from O-M School Board President Rob Halpin; speaker Charlie Wood; graduates toss their caps; valedictorian Emelia Paulisczak presents her speech. ODESSA, June 23, 2017 -- Awards and scholarships were announced and presented as part of Friday night's graduation ceremony in the Fetter-Brown Auditorium at Odessa-Montour High School. The Fine Arts Boosters recognize students who will enter college to study in the fine arts field. The winners fr 2017 are: Simonne DeWalt and Madison Morse. From the top: Alyssa Crout, Breeana Bentley, Kyle Frasier and Jon Andrews are congratulated by Superintendent Chris Wood; Paxtyn Brown delivers introductory remarks as president of the Senior Class; Angelika Friis and Simonne DeWalt receive diplomas from School Board President Rob Halpin; Amanda Jones marches across the stage to receive her diploma; Taylor Sykes receives her diploma from Board President Halpin; Salutatorian Madison Morse is congratulated by High School Principal Almon McCarty. 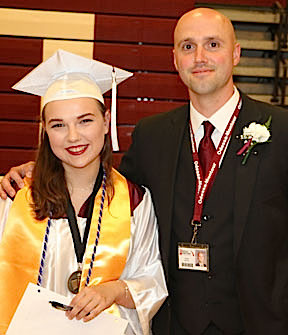 Left: Valedictorian Emelia Paulisczak with Superintendent Chris Wood before the Commencement ceremony. Right: High School Principal Almon "Skip" McCarty at the podium. Music was provided by the High School Chorus (above) and the High School Band.